Having checked the number of postings, here are the top six posters as of today. The award is a set of RD mugs which will wing their way to Coll shortly. Well done! A New Zealand Corporal - Bill Apiata - has been awarded the VC for his bravery in Afghanistan in 2004 - it was annnounced 2nd. July. This is the first award under the New Zealand warrant. The Durban Museum is to be renamed the Rattray Museum in honour of his work . The last of four frigates which the SA Navy bought from German shipbuilders has been delivered. The final is named SAS Mendi. One of the others is SAS Spionkop. SAS Isandlwana was commissioned last year. It's new captain is the first black South African Navy captain, Captain Bubele Mhlana. We trust he will look after a ship with such an emotive name and we send him congratulations and wish him good luck. The launch of A 'Soldier-Artist in Zululand:William Whitelocke Lloyd and the Anglo-Zulu War of 1879' by David Rattray is to be launched in Johannesburg on 13t. March 2007. Nicky Rattray will be at the launch and announcing the establishing of the DAVID RATTRAY FOUNDATION. Martin Everett will be there and will present a cheque towards the fund which has been generously donated by members of the RDVC forum. We will give details of the final amount after the fund appeal closes on 9th. March. There is to be a Memorial Service for David Rattray at Westminster Abbey. Date and details will be posted when arrangements are known. CRIMINALS like David Rattray’s killer do South Africa a lot of damage, especially in the run-up to the 2010 World Cup when the “whole world is supposed to descend on our country”. These were the concerned words of KZN Judge President Vuka Tshabalala before sentencing Thembinkosi Ndlovu (22) to 25 years’ jail time for the murder David Rattray. Ndlovu pleaded guilty to the murder saying that his accomplice, Fethe Sibusiso Nkwanyana, who got the same sentence after he also pleaded guilty, told him to shoot. Martin Everett has supplied some pictures and text from the laying of floral tributes at Isandlwana, taken by Mike Myers. The book has been printed (3,000 copies) - David saw the final printers' proofs but binding was halted - to allow a tribute to be inserted - binding commences this week. Distribution of the pre-paid copies in UK will be through Barbara Lindsay. I expect copies to be in the UK by the end of March if not before. The remainder of the books will NOT be available through normal retail outlets. As you see the museum is probably the most flexible option - and it will help to boost museum funds. TOURISM in KwaZulu-Natal was dealt a shocking blow last night with the slaying of internationally renowned historian, raconteur and Anglo-Zulu War expert David Rattray at his home in Fugitive’s Drift. Coming after seven hijackings of tourists in northern KZN coastal areas in the last month, this latest killing has raised concerns about the future of tourism in KZN. A close family friend told Weekend Witness that he had learnt from Rattray’s wife, Nicky, right after the incident, that the couple had been in their bedroom, with Rattray changing to go cycling, just before 6 pm when they had heard their domestic worker screaming. When the couple went to investigate they were confronted by six armed suspects, one of whom was wearing a balaclava, who had originally entered Rattray’s Fugitive Drift Lodge office and held up the receptionist, demanding money before asking for Rattray (58) by name and breaking into the Rattrays’ house. The source told Weekend Witness that Rattray had pushed Nicky down to the ground, at which point one of the suspects opened fire three times, two of which missed Rattray. But the third was fatal. It is believed that nothing was stolen. Certain friends have speculated that the killing had a motive other than robbery. Best known for his dramatic interpretations of Anglo-Zulu battles, right on the battlefield as well as on international tours, even on international flights, Rattray, who has been described as the “Laurence Olivier of the battlefield” and the “Battlefield Bard”, lived at the world-famous Fugitive’s Drift Lodge with his wife in the Mzinyathi (Buffalo) River area where, in 1879, British troops fleeing the battlefield of Isandlwana tried to make their escape following the crushing defeat inflicted by Zulu warriors on the British force. The distinctive sphinx-shaped silhouette of the mountain that shadows the battlefield is visible from the lodge. Rattray and his wife, university sweetheart Nicky, hosted a constant stream of often distinguished, international visitors around the battlefields of Isandlwana and Rorke’s Drift. In December 2001, Rattray’s contribution to tourism in South Africa was recognised at the Tatler Travel Awards 2002 ceremony and he was awarded the Tatler/Gordon Campbell Gray award for vision in tourism. Rattray wrote the David Rattray’s Guidebook to the Anglo-Zulu War Battlefields and had just completed another book, A Soldier Artist in Zululand. He was introduced to Zulu lore by life-long friend Mzongani “Satchmo” Mpanza, and the two spent days on expeditions into remote areas. In June 1999, Rattray received the Ness Award from the Royal Geographic Society in recognition of widening the popular understanding of Zulu culture in southern Africa. Describing the shooting as “mindless”, KZN-based British tour operator, former senior British army cavalry officer Colonel Reggie Purbrick, who has been bringing British youths to KZN for the past 10 years for “Berg, beach and battlefield” educational tours, told Weekend Witness that Rattray had been an integral part of the tourism attraction and educational value. “David was the one man in the world who had done more to promote black and white, especially Zulu and British reconciliation than any other. I can assure you that David was the one man in the world, who has continually preached reconciliation in every lecture he gave, the last man to hope that this sort of incident would impact on British tourism. My own personal feeling is, of course, that it will,” he said. The impact of Rattray’s murder on tourism in South Africa will depend, he added, on how it is handled by the press, both at home and abroad, and also upon “how the country’s authorities address the awful and gratuitous violence being committed every day” in South Africa. Contacted by Weekend Witness reporters, Fugitive’s Drift Lodge staff said the Lodge had no plans to close down. SAPS officials were unable to offer any more information to Weekend Witness by the time of going to press. Kwanalu president Robin Barnsley expressed his outrage at the killing, saying he is concerned with the level of violence in the rural areas. Kwanalu met with MEC of safety security and transport Bheki Cele recently to discuss these issues. Barnsley called on government to “make sure that all elements of rural society are pulling together to stop the violence”. Agricultural Union chairman, and neighbour Hermann de Wet, who is also in charge of SAPS reservists, said that the community had mobilised forces to search for the suspects, but that no suspects had yet been identified. KZN heritage body Amafa chair Arthur Koningkramer, who knew Rattray for 40 years, said he was “a very kind and gentle man”. Rattray was born in Johannesburg in 1958 and was educated at Pridwin and St Alban’s Collge. He graduated from the University of Natal in 1982, with a BSc Honours Degree in entomology. When he left university he went to work at Mala Mala Game Reserve as a manager from 1983 to 1988. After that he moved to Rorke’s Drift, where he settled down with his wife. 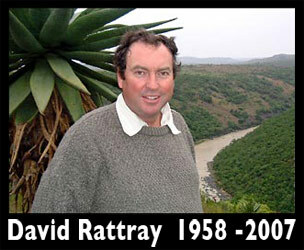 Ratray was a trustee of the Siyasiza Trust, the Magqubu Ntombela Foundation and the John Voelker Bird Book Fund. In 1998, he was elected as a Fellow of the Royal Geographical society. Apart from owning and running the Fugitive Drift Lodge, Rattray also half-owned the exclusive Three Tree Hill Lodge. I have just been told that David Rattray has been shot and is dead. I don't have further details but this has been confirmed by Rob Gerrard of Isandlwana Lodge. Every sympathy goes out to Nicky and his family of course. I hope that further information will throw light on this terrible tragedy. It is reported that British troops in Helmand Province in Afghanistan were given a turkey dinner and shown the film Zulu during it! The grave of Private Robert Jones VC in St. Peter's Church graveyard, Peterchurch, Herefordshire has been beautifully restored. From Martin Everett, Regimental Museum, Brecon. 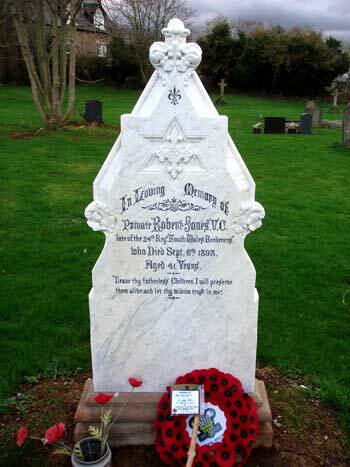 Robert Jones VC, Rorke's Drift defender. For some time, the hero's headstone has been in a sorry state, with lead missing from lettering and moss covering most of the surface. However, Stephen Jackson from Longwell Green in Bristol came to the rescue and engaged Mr N C Pegler, Monumental Mason, Rockfield Road, Hereford to re-furbish the headstone. I think you will agree the results are stunning. Corporal Bryan Budd, 29, of Ripon, North Yorkshire, was killed when he single-handedly stormed a Taleban position in Afghanistan, in August. It is the first posthumous VC to be awarded since the Falklands conflict. He had a daughter aged two and his wife gave birth to their second child a month after he was killed in action. It is with great sadness that we hear of the passing of Henry Bunting, a long standing honourary group member, the grandson of Henry Hook VC. Henry passed away last Thursday, and he had been ill for several weeks. Cyril, his son, e-mailed Danny to tell us and mentioned how delighted Henry was to have been at the grave re-dedication in Churcham and, indeed, how pleased he (Cyril) was at seeing Henry enjoying the day. The funeral is to be held at St Georges Church, Brocleworth, Gloucester, 13:45 on Friday 17th. Speaking at an awards ceremony at the Union Buildings, President Thabo Mbeki said the recipients deserved tribute for enriching the lives of all South Africans. “The honours that we bestow today tell the story of what and who we are and who we shall be,” Mbeki said. One of the few gold awards was posthumously awarded to Bhambatha ka Mancinza Zondi, the Zulu chief who in 1906 rebelled against a poll tax. Speaking at a ceremony at the Union Buildings, President Thabo Mbeki said the recipients deserved tribute for enriching the lives of all South Africans. Ever fancied joining a Victorian re-enactment group but don't know where to start? The 80th Regiment of Foot (Staffs Volunteers) are looking for new recruits 18-50 to join their re-enactment group based in the midlands. They are a very friendly group of enthusiasts depicting the life of the Victorian soldier of the 1870's, doing regular appearances at public events, ceremonies and military displays. Their displays involve Victorian drill, bayonet fighting exercise and firing displays, walkabouts and camp. They were all new members once, so do not expect potential soldiers of the queen to have full kit, and therefore accommodate new members with temporary equipment as a taster to life on campaign in the Empire. It's nice to see that we are listed as a best link and recommended on the BBC site with regard to the Anglo Zulu War. Mind you, so is Saul David with his views and his controversial TV programme. There are a few events this year which may interest visitors to this site. Some of you may like to know that full time student Ms. Elizabeth Hogan, as one of the main guests, is to open the 'Firepower' event in Woolwich.